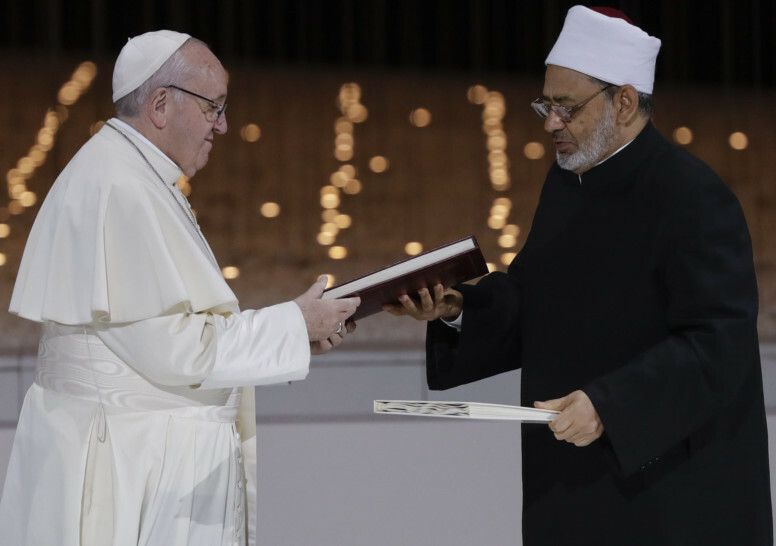 Vatican City: Pope Francis said on Wednesday he hoped his historic trip to the Arabian peninsula will help dispel the notion of an inevitable clash of civilisations between Christianity and Islam. Francis returned to Rome on Tuesday from the UAE, where in Abu Dhabi he celebrated the largest public Mass ever celebrated on the peninsula where Islam was born. “In an era, like ours, where there is a strong temptation to see a clash between Christian civilisation and the Islamic one, and even to consider religions as a source of conflict, we wanted to send another clear and decisive signal that encounter is possible,” he said at his regular general audience. Francis was referring to a document he signed during the trip with Dr Ahmad Al Tayyeb, Grand Imam of Al Azhar. Francis, a progressive who has been in the crosshairs of conservatives since his 2013 election, responded: “Not only the Muslims. They accuse me of allowing myself to be used by everyone, even journalists. It’s part of the job.” But he said “from a Catholic point of view, the document had not strayed a millimetre” from teachings on inter-religious dialogue approved by the 1962-1965 Second Vatican Council.